Chanel doesn't release too many blue centered palettes. The previous bluish eye quad was Bleu Celestes in 2008 and before that we had Jeans de Chanel in fall 2003, one of the most beautiful collections. The Jeans quad made me a blue believer after years of avoiding this color. Now we have Lagons (#29), one of two eye shadow quads (I'll review Vanites later this week) in the Sophisticated Eye Collection (because what was missing from our lives was another Chanel collection, which makes it the fourth one this season). The two quads join the permanent line, which is a very good thing. We're talking Chanel and a Sophisticated Eye Collection, so the finish, colors and application are going to enhance the eyes, not take over the face. The texture of Lagons is the ultra smooth and silky one we've been getting from Chanel Les 4 Ombres quads over the last seasons. They are a joy to use as the colors offer distict but semi sheer pigments- that's not saying they disappear or not strong enough or whatever- they're quite distinct, actually and can be seriously packed on if you so desire. 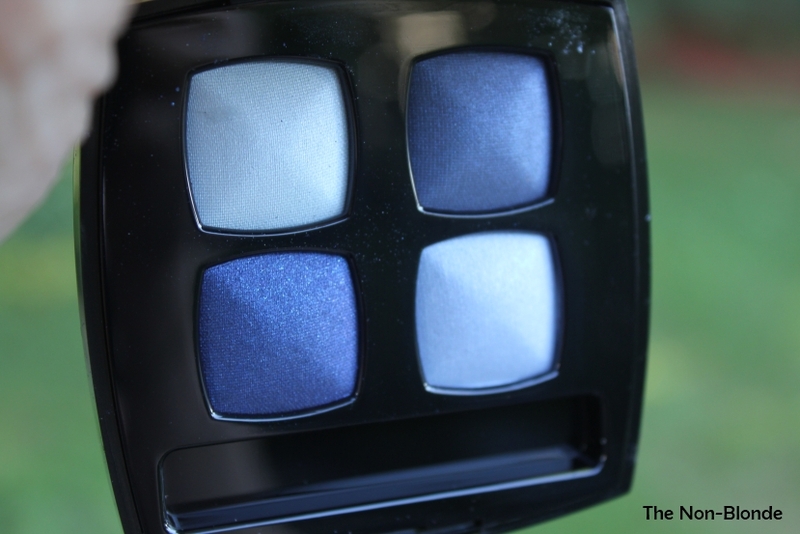 But the thing that makes these Chanel colors so wonderful (and addictive. 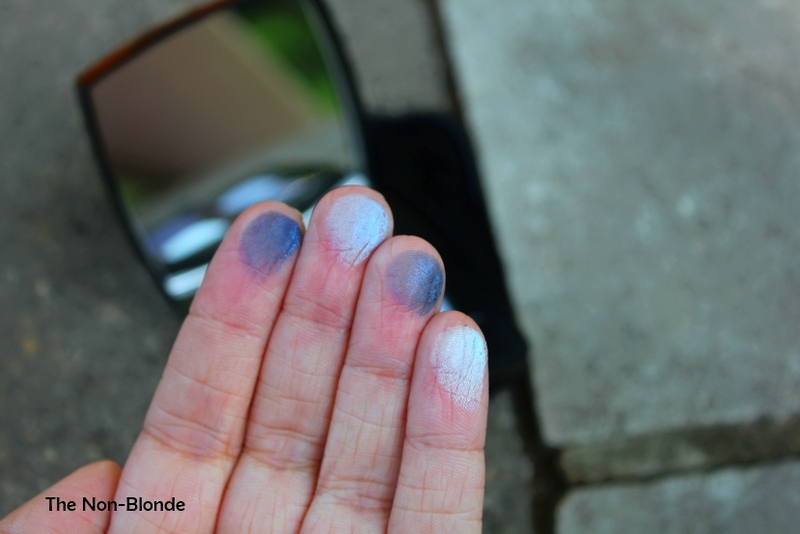 Sigh) is the way these colors are formulated to work with the skin: they don't coat the lid in paint. Instead, they give you an aura of color that glows and enhances. This quality should be observed in real life on your lids, as photos and swatches don't capture it. So I highly recommend getting to a counter if you have the option. 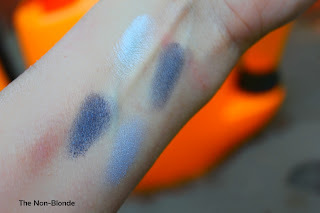 Lagons offers four blue shades, two light ones (powder blue and almost aqua baby blue) and two darker hues, the richest one heavier on shimmer and makes for a gorgeous contour/lining/smoky eye color. My recommendation is not to go all out there, but instead use just two or three at a time and blend with a neutral or two. Here's what I did today: I applied LMdB Naked all over as a base and a super subtle not-quite highlighter under the brow. 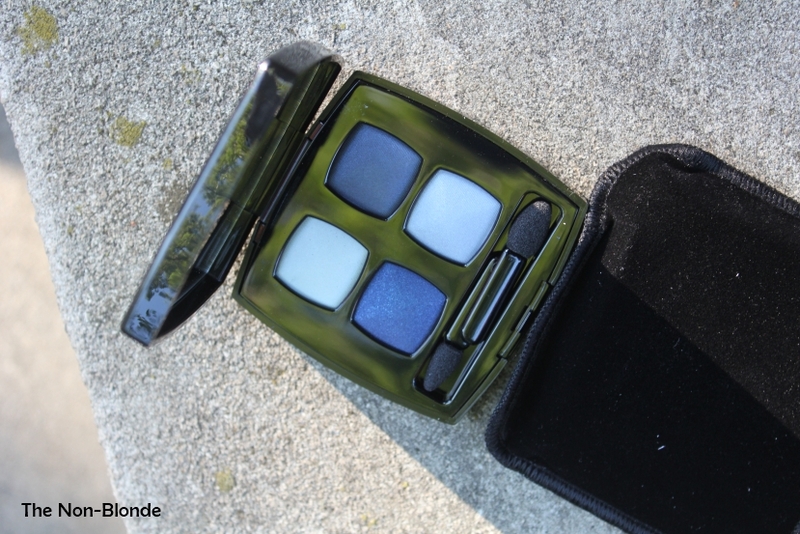 I then patted the bottom right light blue shade on the lid, just to give a bluish cast. Moistening my favorite pencil brush (Hakuhodo B533BkSL) I applied the darkest color along the upper lash line and just a barely-there hint under the lower lashes. Then I blended everything with Shu Uemura 8HR brush and just a touch of Bobbi Brown Cement matte eye shadow to bring it all together and deepen the crease. You can't really tell I applied this extra color, but it's my secret weapon when using bright or bold colors. 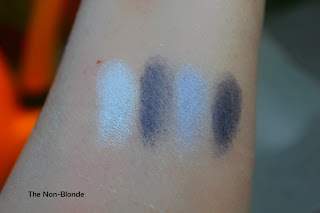 Chanel Lagons 29 Les 4 Ombres Quadra Eye Shadow ($57) is available at the counters and from chanel.com. Chanel Lagons photos and swatches by me, vintage makeup images from myvintagevogue.com. Me want that palette!!! A lot of ways to apply those just pops around in my head now!!! I'd love to see examples of blue eyeshadow done the right way. Cannot stand blue eye shadow; but then, I am blue-eyed. 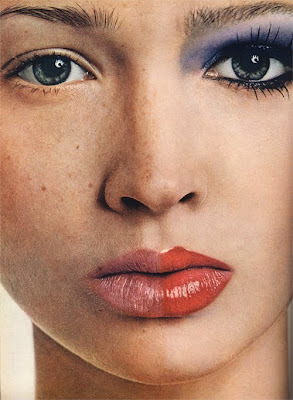 Still, I used to love those Aziza shadows. I once had a friend who owned about a dozen of their pallets. I could not believe that she found all of those colours appropriate, but back then she was known to be quite glamorous! well, if you don't like THOSE applications, show me some you do like! 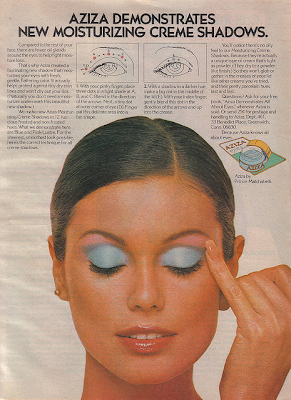 hahaha... wore my aqua blue shadow - by revlon - a lot like the first photo. back in high school. and it looked pretty good! 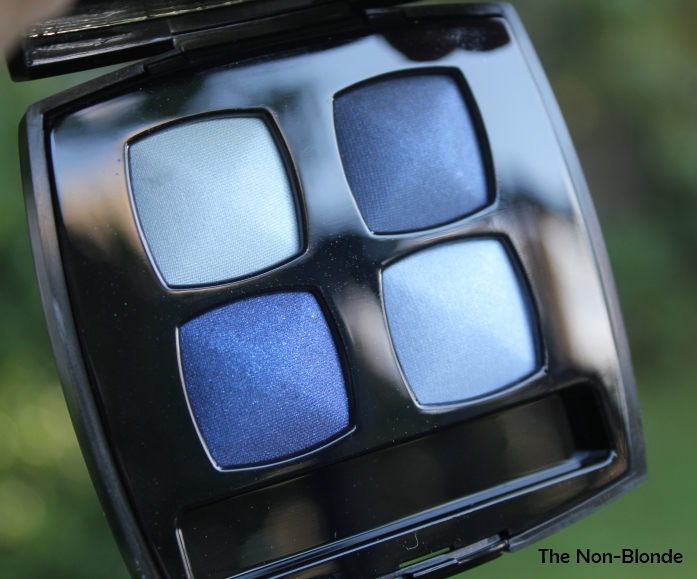 so i really would like to know what you think a proper application of blue shadow is... because those are pretty blues! This palette is being discontinued. Guess the new teal-centric Fascination palette is replacing it.